Declaring their sibling trucks to have more horsepower than any other midsized pickup truck, General Motors issued revised power ratings for its 2015 GMC Canyon and Chevrolet Colorado truck models. These revised power output numbers are in comparison to other similar-sized compact pickup trucks. So there is no confusion, the only real difference between the GMC Canyon and the Chevrolet Colorado is the Canyon has more luxury options than the more-basic Colorado. Both trucks are manufactured by GM. The standard GM 2.5-liter four-cylinder engine with direct injection will produce approximately 200 horsepower at 6,300 RPMs while delivering 191 foot pounds of torque at 4,400 RPMs. The larger 3.6-liter V-6 power plant with direct injection creates 305 horsepower at 6,800 RPMs with 269 foot pounds of torque at only 4,000 RPMs. In its earlier initial specifications, General Motors originally estimated the four-cylinder engine would produce 193 horsepower with 184 foot pounds of torque, whereas the V-6 engine would create 302 horsepower and 270 foot pounds of torque. 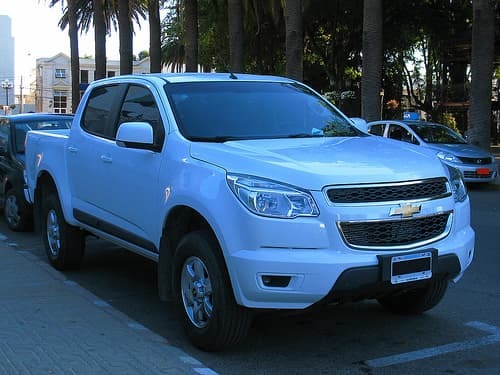 This indicates that both the GM Colorado and Canyon models with the V-6 engine will produce more power than either the Toyota Tacoma or Nissan Frontier 2015 models. For comparison, Toyota rates their 2015 Tacoma at 236 horsepower with 266 foot pounds of torque, giving the Tacoma slightly more horsepower, but not as many foot pounds of torque, as the Nissan Frontier, which produce 261 horsepower with 281 foot pounds of torque. The four-cylinder Toyota Tacoma produces 159 horsepower with 180 foot pounds of torque, whereas the four-cylinder Nissan Frontier creates 152 horsepower with 171 foot pounds of torque. The Honda Ridgeline produces 250 horsepower and 247 foot pounds of torque with its V-6 engine, but Honda has chosen to forgo producing the Ridgeline for the 2015 model year ahead of a redesign for 2016. Based solely on horsepower ratings the two GM trucks do technically own the title of being able to create the highest power output with the two engine options. Of course, engine output is only one factor in the power and acceleration calculation, and the trucks will need to have a thorough head-to-head test-track shakedown before a champ can be crowned. However, as always, buyers will have the final say as to whether or not the GM Canyon and Colorado models stand above the rest of the field when the trucks go on sale in 2015.